Anyway, the chrysanthemum recalls me of the funeral. At the funeral, the photo of the dead is displayed surrounded with lots of small yellow chrysanthemum. The word for 'kiiku', chrysanthemum in Japan, was used for the name(both boys and girls ) until seventy or eighty year's ago(the grand father age). There is a Kitano's film called 'KIKU-jiro no Natsu', the summer of KIKU-jiro. Jiro is often used for the second sun's name. So, what I want to say here, the chrysanthemum is not pop or cute flower which you might not choose ones for the girlfriend's birthday gift. Light ink with small squared the tip of the hair of the brush(fude-saki). You squeeze fudesaki after dipping the ink. The squared fudesaki depict the round tip of the petal. Draw the center part of the flower. This part of the flower still like a bud, so the drawing stroke must be short and hard touch. It has little curving and sweeping at the last part of stroke. You take a half breath at the first touch of fudesaki on the paper. That moment gives the round shape of the petal tip and more importantly the blacker color of the tip. Eight strokes for the center part. Petals around the center are longer and winding. The shape of fudesaki is the same as well. Every stroke must be toward the center. Think the real petals are connected at the center and each petal grow from the one point. Almost the same as asagao leaves drawing. One leaf is depicted by eight strokes. Top left, middle left, the bottom, the middle right, then top right. Two for each small part of leaves. The bottom part ; You bring the body of the brush (jiku) down toward yourself at the last move of the stroke. At that time, the body part of fude hair must touch on the paper. You pull fude up, then the round shape will show up. That is the tip of the leaf. Use fude as a stamp. Bend the fude hair on the cloth. Put the very black ink on the ink stone on the behind of the bent fuse hair. Then, draw the thin vein line on the leaf. The line won't show up until the ink becomes dry. Draw lighter black leaves behind very black one. Remember, draw black one first. Wash fude and bend the fude hair on the cloth. Put the very black ink on the ink stone. Some might think cosmoses are pretty slightly flower because we see them dancing in the Autumn wind. But if you see carefully, you notice cosmos has thick petal. So, when you draw cosmos, you have to have heavy touch on petal part, and soft and thin touch on the stem. Fork the tip of the hair so that you can depict the divided top of the cosmos petal. To folk it, squeeze, or press only the tip after putting the ink.You can give two strokes for one petal. Drawing direction : Top to the center. Use only the tip part of the hair. You start to draw at the very light touch and keep lightly while moving. At the end of stroke, you pull the brush up little to express the petal end edge shape, which is the connection part with each petal and stamen(the body of the flower). Eight petals in one set. Top two petals first, then the both side of the top and the bottom. The length of the bottom petals are shorter than the top ones. You can accent the length depend on which side the flower face turns in. The flower face direction is important to give your drawing the sense of the flow. Don't refill ink during the petal drawing. One supply for one set of the flower. You can get good gradation in the one set of the flower. Need the very black ink. Bend the brush hair. The same shape as the line drawing. Then, just point on the paper, making circle. Light black ink. Bending hair shape. Both the stem and leaves of the cosmos are so slim. You don't need to be careful about stem and leaves. Outline with the thick line. First, lighter black (and lots of water in the heir of the brush. ) is used. Then, the black ink (with not much water) lined along with the lighter lines. This black line depicts the shadow. So, you have to think of which way the sun light comes from to this water fall scenery. Flat the hair of the brush. then draw the square stroke. Remember, you always have to shape the brush good before start drawing. 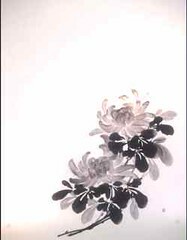 A good shape and carrying the appropriate volume of water deliver the great sumi-e panting. In this case, waterfall is water so the brush is better to be moisturized more than usual. The top of the waterfall must be the square shape because there would be thr river runs over there and the surface is flat. The blank of the water pool shows you there is spray of the water.